One of the more exciting highlights from this past summer was the new partnership we formed with the team at Capital One. Capital One is bringing their innovative new banking experience known as their Capital Once Cafes to South Florida, and they are looking to invest deeply in our community. In addition to offering their portfolio of financial services & products, the cafes will be inviting spaces where visitors can hold a meeting, grab a coffee, or simply connect with others. We love this approach, and are so grateful they chose Casa Valentina as one of their partners in Miami to create momentum for positive change. Not only will we be working closely together on delivery of our financial literacy curriculum, but we will be creating a community garden as well! There are many exciting ventures ahead as we grow together; stay tuned for more! As you can see from our photos, Hurricane Irma may not have hit us directly, but many of us in the South Florida community certainly felt its effects. Our property suffered a lot of fallen branched, downed trees, and some of our fences were badly battered. Thanks to Capital One, not only were we able to clear the major obstacles with the help of professional services, but their team of volunteers came out to lend their strength to clearing our property to make it safer for our residents. 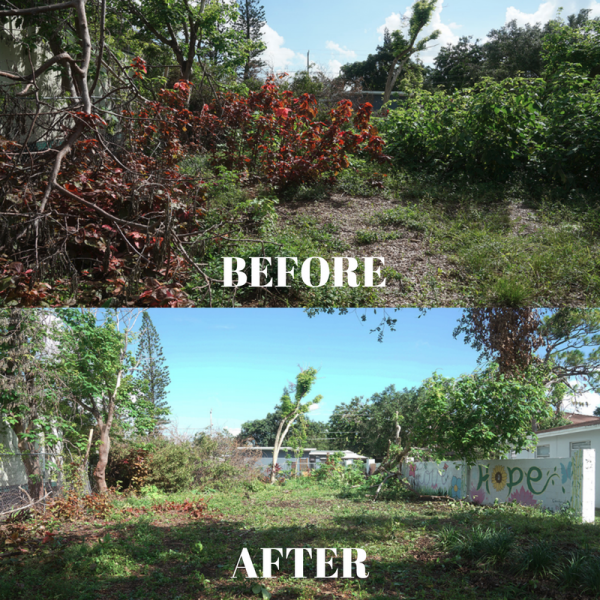 After 5 hours in the Miami sun, the team was able to clear over 85% of the lot that had a lot of debris blocking the path of residences.